Sasha F started his career as a DJ around 15 years ago and during this period he definitely showed the world what he was worth as a professional jock and producer. He is now one of the most wanted Hard Dance artists from Finland and his popularity around the globe is rising fast. His DJ skills have been showcased throughout Finland where he, alongside other top Finnish DJs, usually headlines the big gigs. Besides that he also is a regular guest at major events in countries like Russia, Estonia, Thailand, England, Germany, The Netherlands and Italy and he was part of the Invasion Tour in The USA doing 20 gigs in 40 nights, coast to coast. As a producer he is known for releases like Get Hit (together with Crypsis) Hardstyle Matters and Drop 2 Your Knees (together with Chris One). He released his records at different labels, such as Minus Is More and Next Chapter. In 2010 he joined the TiLLT Records label, as his raw tracks certainly fitted their profile. 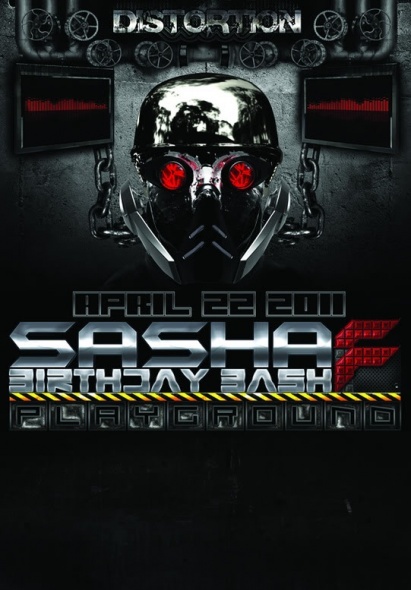 With a combination of superb technical mixing and a raw hardstyle sound, Sasha F leaves each crowd begging for more. Martin Björkman aka Chris One is one of the new names in hardstyle, but also one of the fastest rising ones. With a style that represents the hard and dark, he has already played in multiple countries at parties of all different sizes (Including DefQon.1 Festival 2010). He's been supported by some of the biggest names in the scene like The Beholder, Deepack, B-front, Crypsis, Alphaverb and so on, while Martin is only 18 years old yet! Despite his young age Martin has already released hard kicking tracks on labels like TiLLT Records, Theracords and many more. 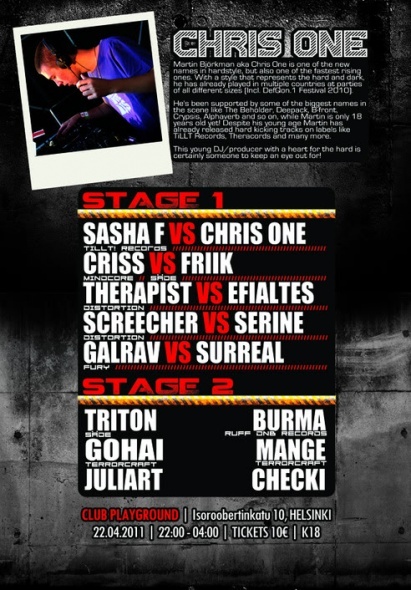 Distortion Presents Sasha F Birthday Bash kilpailu! Sopivasti on vielä aikaa jäljellä itse tapahtumaan joten on oikea hetki laittaa kilpailua tulille. Kaikkien 20.4 mennessä Distortionin Facebook ryhmään liittyneiden kesken arvotaan 3 tapahtumalippua joiden kylkiäisenä on ilmainen drinkki.